Thermal mass describes a material’s capacity to absorb, store and release heat. It can have a positive effect on the energy performance of an exterior wall system or interior of a home. Thermal mass can both store heat and cool, evening out temperature fluctuations. Any material can capture, store and radiate heat, which essentially means all materials have thermal mass (to a lesser or greater degree). The general rule here is that the denser and heavier a material is, the higher its value as thermal mass. Like other technologies and materials, such as solar panels, thermal mass is a component of passive design. 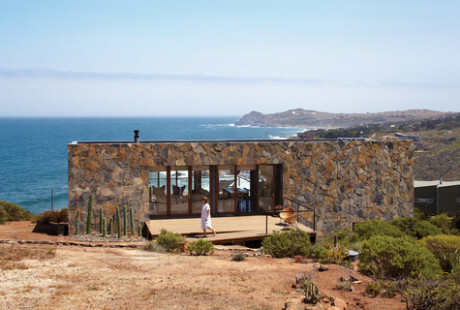 Imagine an exposed thick concrete wall of a home is heated during the day by the sun; the wall is progressively warmed. It’s cooler inside, and so heat slowly conducts from the outside surface inwards. As temperatures fall during the night, the heat flow reverses. The heat of day and coolness of night are each tempered by the benefit of thermal mass. If thermal mass is there, this transfer takes time and with this time delay, we feel the coolness of the wall during the day and the warmth during the night. This process is known as conductive heat flow, and is no different that heating a pot to boil water, then cooling it, for example, by submerging it in ice. It is most effective when the daily temperature fluctuation revolves around the indoor set point, cycling above and below indoor temperatures within a 24-hour period. Even if the outside temperature fluctuates but never crosses the indoor set point temperature, thermal mass can be beneficial in delaying the peak heating or cooling load, taking some burden off of mechanical systems. For those already familiar with thermal mass, you’ve probably already heard the term ‘R-value’ as it’s used in the construction industry. R-value is the measure of an insulating material to resist heat flow, where higher R-value, the greater the insulating power. Thermal mass offers “mass-enhanced R-value”, and is greater than its steady-state R-value. As mentioned above, concrete is a routine favourite when it comes to providing thermal mass. Other high-density materials that provide high thermal mass in building applications include stucco, adobe, stone and rammed earth. Rammed earth, an increasingly popular building material, can be made from a combination of ingredients like stone, gravel, clay, and sand. After being pressed into its final state, rammed earth can be used to make highly insulated walls and floors. Thermal mass promotes passive heating and cooling of a home. This lowers the burden on mechanical heating and cooling systems. For a homeowner, effective thermal mass can help lower utility bills and can become a component in building a more passive house with a reduced environmental footprint. Careful consideration of thermal mass is a small part of a home’s thoughtful design, where creating meaningful space matters. A rammed earth wall is pretty easy on the eyes, too. Like the foundation of a house, a comprehensive site analysis lays the groundwork for thoughtful home design. It may (or may not) come as a surprise that the first step of thoughtful home design starts before a home is even conceptualized. During site analysis, information is collected about the climate, weather and physical environment. This data allows us to determine the practicalities, natural opportunities and constraints of a new home build. We prefer to build houses that stand for a long time, and to do so it’s important to site the home with careful consideration of its immediate exposure and climactic context. We live in a rainforest here in Metro Vancouver, where there is substantial precipitation. Considering how the site already handles water helps inform our process. We study the slope, permeability and drainage in place, looking for opportunities to nourish and replenish groundwater without creating flooding or stoppages. By being aware of prevailing winds, and seasonal trends, we can position a home’s exposure to receive cooling breezes when they are welcome and repel cold gusts when they are not. We study the sun and shadow patterns in order to optimize natural light, views and connections to the outside in a purposeful way. If we can begin with naturally positioned elements that allow the low winter sun inside, and shade the high summer sun, we take the pressure off of mechanical systems to do the work of heating and cooling. We help our clients enjoy the space – while saving money on utilities over years to come. By looking at annual temperature fluctuations, even in our temperate climate here on BC’s south coast, we can gauge the effectiveness of thermal mass assemblies and help inform home design decisions such as window glazing and insulation. From topography to geology, the analysis of a site’s physical environment is done primarily to determine construction feasibility. This can identify hazards that could compromise a house’s foundation. On a sloped site, for example, attention would be paid to the risk of mass wasting, which could result in mudslides. Proximity to bodies of water could pose flooding hazards and in the case of fast-moving water, soil degradation. Design decisions that follow this analysis will relate closely to the principles of design psychology that we employ. This important start to our design work helps create the foundation for a home that is customized both to its natural context, and our client’s needs and desired experiences. Just like the physical construction of a house, thoughtful home design starts from the ground up.